He's a pest. A menace. And worst of all, he sits next to her in class. All Yokoi wants is to be able to pay attention to her teacher's lessons, but somehow her focus is always pulled away to what Seki is up to. Because he's always up to something, whether it's playing a game or building some mind-boggling creation on his desk. While their teacher is speaking! While Seki should be taking notes! And yet Yokoi is the only one who ever notices. She's the only one who sees disaster looming as Seki's nefarious plans slowly build to their evil fruition. And worst of all, while Seki always seems to get away with it, the constant distractions and paranoia that he's inducing in Yokoi keep getting HER into trouble! It's just not fair! But despite the consequences, Yokoi finds herself unable to look away. To ignore him. 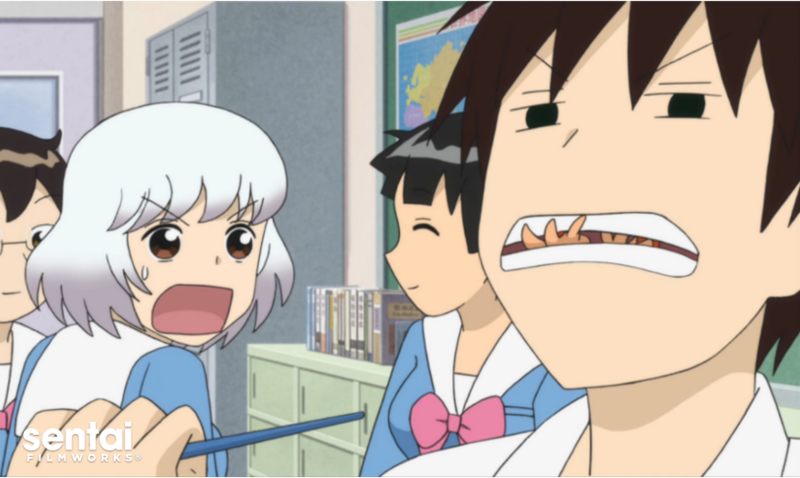 So with every class, the tension and torture begin again in TONARI NO SEKI-KUN!